Charming villa with wooden shutters. Three quarters of the house has a covered balcony with seating. The interior is atmospheric and well-kept. The detached villa is situated in the quiet residential area of King Park. Enjoy yourself in the beautiful, well-kept, fenced garden, that has a surface area of no less than 900 square meters. 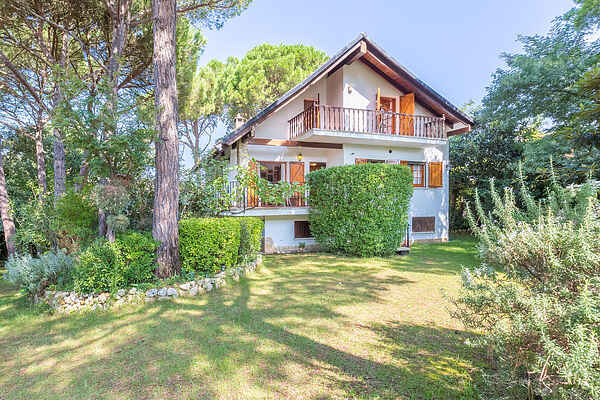 The children can play and frolic in the large lawn (with pond and stone BBQ) around the house, while you enjoy a book in the shade of the large pine trees or sunbathe on a lounge chair near the wonderful private swimming pool, with a separate area for children and an outdoor shower. It seems like a shame to leave this place, but the surroundings and the Spanish interior are too beautiful not to explore. Lloret de Mar's sandy beach is 15 km away. Make a trip along the coast, full of lovely inlets and beautiful little beaches, to Tossa de Mar, with its castle and small shopping streets. Or to the botanic gardens in Blanes (21 km), the historic city Gerona, or the lake in Banyoles (48 km). The imposing Montserrat mountain range, with its famous monastery (98 km), is also surely worth a visit.